I'm recently came across the San San HD Liquid Foundation and I am definitely obsessed. This is the only foundation in my makeup collection that gives coverage and lasts longer than usual. I've been using it for more than a month now and so far so good. The San San HD Liquid Foundation in Olive is definitely one of the sulit foundation available in the market today. 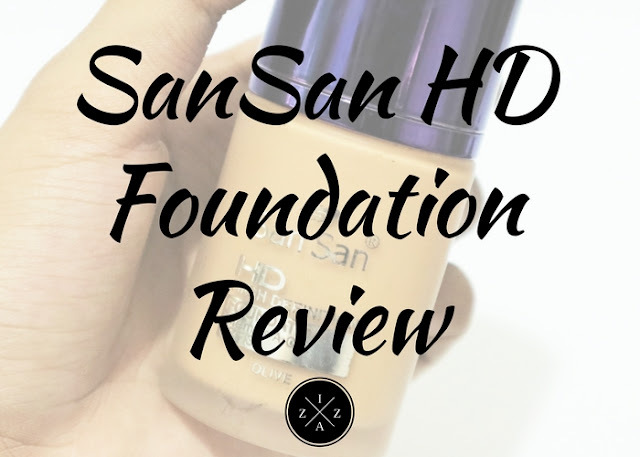 The San San HD Liquid Foundation is part of the High Definition makeup line of HBC. I have featured the HD Powder Foundation and HD Concealer on a separate post you can READ HERE. Love that the San San HD Foundation comes in a pump. The San San HD Liquid Foundation claims to give the excellent coverage for skin imperfections. It is also formulated with vitamins A, C and E with SPF 30 for a healthier and naturally radiant skin. The product also claims to be an oil-free liquid foundation and will blend superbly with any color cosmetics for a picture perfect look. 205pesos for 30ml product. I got one in the shade Olive. Other shade includes Natural, Beige, Tan and Silk. Olive shade is perfect for Filipinas since it has yellow undertone. I included this San San HD Liquid Foundation in my Current Makeup Menu for November because I've been using it so much for the past couple of weeks. Whenever I have a hosting gig or I want to glam up this particular foundation is what I rely to. Now as I mentioned earlier this is the first HD Liquid Foundation that I have so I can't really give you a good comparison. But for someone who is used to BB Creams and CC Creams, this San San HD Liquid Foundation in Olive is truly different. Ingredients an other information at the back. First and foremost this products comes in a frosted glass packaging and pump applicator. I love that I can get just the right amount of product that I need for my whole face. The frosted glass bottle however is a bit of a con because I noticed that it can get easily dirty. Second, unlike my BB Creams and CC Creams this liquid foundation is very creamy. The formula is also very thick compared to what I am used to. Though it claims to give a natural finish I believe that the product can be a little cakey especially if you apply too much. How I Apply it? The best way I apply this San San HD Liquid Foundation in Olive is through the paddle brush I bought in Pretty Angel Shoppe. If not with the paddle brush I use my mushroom brush instead. In my experience using an applicator is a must for this foundation. The fluid texture makes it easy to blend. Using a brush will give you a medium coverage as long as you buff or stipple the product. You can also opt to use a blending sponge to give a more natural finish. I actually use a blending brush in applying a second layer of this product under my eyes, forehead, bridge of the nose and chin area (as a concealer + highlighter). The shade Olive is perfect for my skin tone. The foundation become invisible in an instant. I also love that I can mix my other BB Cream and/or CC Cream to the product to adjust the color and the effect. Here's my face wearing the San San HD Foundation. It gives medium to full coverage, buildable and sets matte finish. I love how both my bronzer and blush sits on the foundation. I also don't recommend this foundation for those who have dry skin because it will definitely set on your laugh lines. This works best to combination to oily skin (including acne prone). In my experience I use a mattfying powder like Avon Ideal Oil Control Powder Foundation to set my face makeup. On normal days I don't use a setting powder and it is looks fine because the finish of this is matte. The San San HD Liquid Foundation in Olive will last you up to 4-5 hours. You can use a blotting paper to control shine and just reapply with powder. Both my City Colors Be Matte Blush in Sunset Safari and NYC Bronzer in Sunny match this foundation well. I actually have low expectation with San San HD Liquid Foundation when I first bought it. It even took me a week of waiting before I decided to use it. I was afraid that the shade will not match and that it will look super cakey. Fortunately this HD liquid foundation is amazing. I really love it and will be part of my best find for 2016. If you are looking for affordable local foundation then this should be part of your list. Will try to purchase the San San HD Powder Foundation too and see how they work together. Thank you for reading my post. I hope you enjoyed this review.